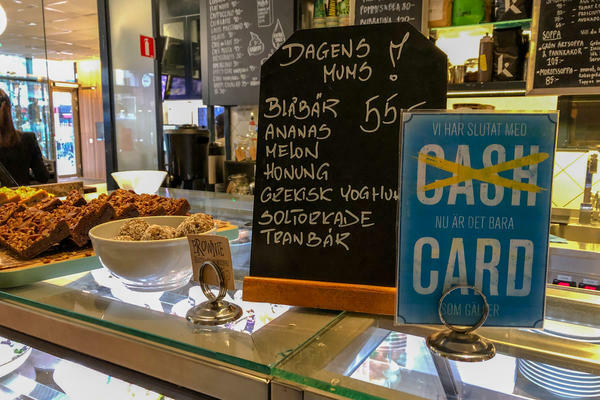 The Urban Deli cafe in Stockholm no longer accepts cash for any transactions. Going cashless is a growing trend throughout Sweden that some are beginning to question. However, Ingram Bogusz points out that the recent Cambridge Analytica scandal, in which a personality profile test scooped up Facebook users' data for political research, has made more people aware of how their data could be used. Also, advocacy groups are becoming increasingly vocal about the potential downsides of a cashless society. "There is a very, very large number of people who ... don't think that the state should be trusted as blindly as many do," Ingram Bogusz says. Sweden may be at the forefront of the cashless trend, but it seems the country is still not quite ready for a completely cashless future. Cash may be king, but there are more ways to buy and sell and store our money than ever before. We're looking at what's beyond cash in this month's All Tech Considered. KELLY: For a glimpse of what the U.S. economy might look like in the future, we head to Scandinavia. No country is dropping cash as fast as Sweden. Just 13 percent of people there reported using cash to buy something last year. But as Maddy Savage reports from Stockholm, some Swedes are concerned that things have changed too quickly. MADDY SAVAGE, BYLINE: Next to the cinnamon buns and open sandwiches at this restaurant, there's a large blue sign with the English word cash crossed out. Notes and coins stopped being accepted here a year ago after staff noticed most people were hardly using them. CHRISTOPHER LOOB: It was super rare, I'd say 5 percent - something like that - in the restaurant was using cash. SAVAGE: That's general manager Christopher Loob, who's been keeping an eye on how customers have responded. LOOB: There's hardly been any reaction. Almost everybody has the alternative payment method - a credit card - and it's good for both the guests and for us. SAVAGE: He says scrapping cash saves time at the till and helps protect against theft. That's been a worry for many Swedish businesses since a string of high-profile robberies in the early 2000s. A strong digital infrastructure and a small tech-savvy population have also encouraged the cashless trend here. But there are growing concerns not everyone is benefiting. CHRISTINA TALLBERG: I'm Christina Tallberg. I'm the precedent of the National Pensioners Organization. I'm 75 years old. In Sweden, there are about 1 million inhabitants out of 10 million who are not familiar to use digital way. SAVAGE: She says the majority of this group are over 65, but it also includes people with certain disabilities and newly arrived refugees. LOOB: You need it in many ways for restaurants, shops, when you are going to park your car, then you should also use an app or a card. So that's making a lot of difficulties. SAVAGE: She says even going to public toilets can pose a problem. They often cost 10 kroner, which must be paid by card. Another concern is that most banks have stopped letting people take out or pay in cash over the counter. Sweden's central bank, the Riksbank, has been pushing local branches to keep notes and coins in circulation. BJORN SEGENDOR: Hi. I'm Bjorn Segendor. Welcome to the Riksbank. We would like to see the banks continuing supplying their customers with cash services. SAVAGE: Do you think Sweden thought things were going to go this quickly? SEGENDOR: I think most of us has been taken by surprise by the speed of this development. Most countries are pushing digital technology, and if you are successful, this will have consequences for cash. SAVAGE: The security of digital payments is another issue for the authorities, but Claire Ingram Bogusz, a postdoctoral researcher at Stockholm School of Economics, says that, in general, Swedes have very high levels of trust in banks and institutions. CLAIRE INGRAM BOGUSZ: Ordinary Swedes are not concerned at all. The convenience of having your bank account, your money at your fingertips and increasingly on your smart watch vastly outweighs any concerns that they have about security or about being tracked. SAVAGE: Back at Urban Deli restaurant, the coffees haven't stopped flowing all day. Most of the customers here are in their 20s or 30s, and it is hard to find anyone with major worries about the cashless trend. ALEXANDER BLOMQVIST: Cash is a hassle. For instance, alot use digital taxi apps like Uber. You don't have to hassle with cash. SAVAGE: That's Alexander Blomqvist. Another customer, Fabien Asytn, says he would even support a feature where notes and coins are phased out completely. FABIEN ASYTN: No one uses it anymore, so it's just easier to just get rid of it. SAVAGE: But even in this innovative country, it seems most Swedes are not ready for a completely cashless future. A nationwide poll says 7 in 10 still want cash to stick around for now. For NPR News, I'm Maddy Savage in Stockholm. Transcript provided by NPR, Copyright NPR.